Would you like to work at home scanning barcodes? It sounds pretty simple, right? I did this for quite some time, and I highly recommend it for those who shop weekly. NCP better known as National Consumer Panel or Nielsen, is a research company that needs our help. They study the habits we have in several different ways. This one research panel will look at your shopping habits by providing you with a hand held scanner that you can use in the privacy of your own home. When you Apply as a panel member, you will be qualified based on your zip code. If qualified, then you will be shipped a handheld scanner. You will use this scanner to scan the barcode of items you buy. You will need to keep your receipts, so you can enter the price you paid into the scanner. It will have a number pad on it for easy entry. As you scan the barcodes, it will save onto the scanner, and you will need to upload the information via USB to your computer. NCP will provide the database for you to upload. As you upload this data, you will accumulate points in which you can redeem. This is where you will reap your rewards. However, there are more benefits to being an NCP member. Every month when you upload your information, you will receive an entry into their monthly sweepstakes for $500. This money will be put on an American Express Rewards Card. Basically each week you upload your scanner data, you will gain 1 entry. So you will have a total of 4 entries each month for the $500. You also have the chance to win the quarterly drawing where 4 members will be chosen to receive a Visa Prepaid Card. And as always each week of data uploads also counts towards the $20,000 sweepstake. Every quarter one panel member will win this. If this sounds like a good way to earn extra each month with a nice chance of winning some sweepstakes too, then be sure to Apply as a panel member, and check out all of the reviews for the company. 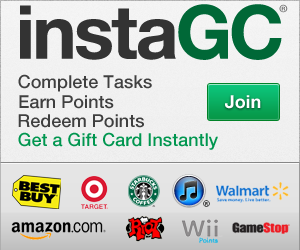 If you’re interested in how I make $100+ a week, be sure to check out my post How to make $25 a day using Instagc. To see more ways to earn cash and rewards, click here.